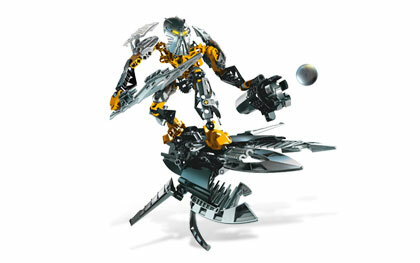 The Mask of Life created a body for itself from stray molecules and has become Toa Ignika, the Toa of Life! Now, flying on a powerful skyboard and armed with a Midak Skyblaster and keen sword, he is determined to be a hero. Toa Ignika has blades on his shoulders, 5" (13cm) long sword and a Midak Skyblaster that really fires! Attach and detach Toa Ignika from the skyboard! Toa Ignika stands 7" (18cm) tall and skyboard measures 11" (28cm) long!